The scale of ancient woodland being lost to development in Britain is being made worse because of a lack of accurate data. The Woodland Trust says that systems are so poor, the government cannot say how much ancient forest has disappeared in the last 10 years. However, a new report from the Forestry Commission says that the UK's tree cover has increased significantly. They say the amount of forest has more than doubled in the last 100 years. Ancient woodland is defined as forests that have been in existence since 1600. These older trees only cover some 2% of the UK but are highly valued because of the scale and diversity of wildlife that they harbour. While their numbers were first recorded in 1981 in the Ancient Woodland Inventory, campaigners say it is an inadequate tool as it does not count stands of trees smaller than two hectares. The Woodland Trust says there is no adequate recording of ancient forests lost as a result of development on either a local or a national basis. "If we ask the government how much ancient woodland has been damaged or destroyed by development in the last 10 years, they cannot tell us. The figures around the losses just don't seem to be accounted for," the Trust's Austin Brady told BBC News. "The reality is that planning decisions on ancient woodland are giving consent for the destruction and removal because there is considered to be a local need for that development." 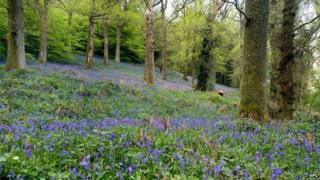 The trust says it is aware of at least 400 ancient woods currently under threat in the UK. It points to the example of Oaken Wood in Kent, where 32 hectares of ancient woodland will be destroyed to facilitate the development of a quarry. The government says that the current planning system provides adequate protection for these ancient woods. A national planning policy framework was introduced in 2012 that removed a default "yes" to development in the guidelines. The Forestry Commission has published new details about the scale of tree cover across the UK. Its report says that Britain now has two-and-a-half times more forest and woodland than it did 100 years ago. Some 13% of the UK, amounting to almost four million football pitches, is now covered in trees. The information and maps have been compiled as part of the National Forest Inventory. "Managing forests to provide these benefits is a complex business which needs precise and up-to-date information," said Wilma Harper from the Forestry Commission. "The National Forest Inventory will be the most accurate inventory of our forest resources we have ever produced, and provides a great baseline to work from as we move forward." But the Woodland Trust says that much of the increase is in the "wrong type of forest", including many pine trees that were planted in the 20th Century. "Not all woodland is created equal; some of it is non-native conifers, some of it is our most precious ancient woodland that has been there for centuries," said Austin Brady. "You can't trade one for the other." A government spokesman told BBC News: "Strong protections are in place for the Green Belt, ancient woodland, Areas of Outstanding Natural Beauty and many other countryside and heritage treasures, such as World Heritage Sites. "The national planning framework also puts power back into the hands of local people, ensuring they are in charge of deciding the areas they wish to see developed and those to be protected."